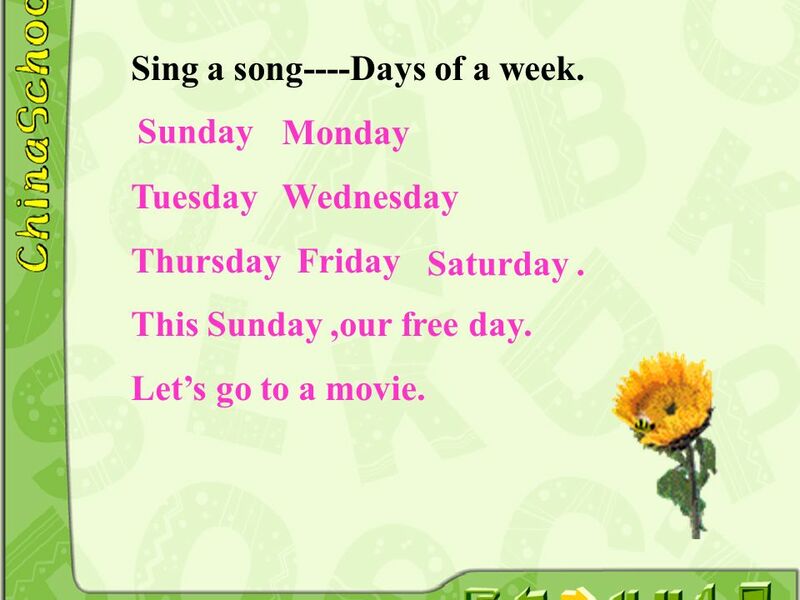 2 Sing a song----Days of a week. Monday Tuesday Wednesday Thursday Friday This Sunday ,our free day. Let’s go to a movie. Sunday Saturday . small groups: 1. Do you like weekend? 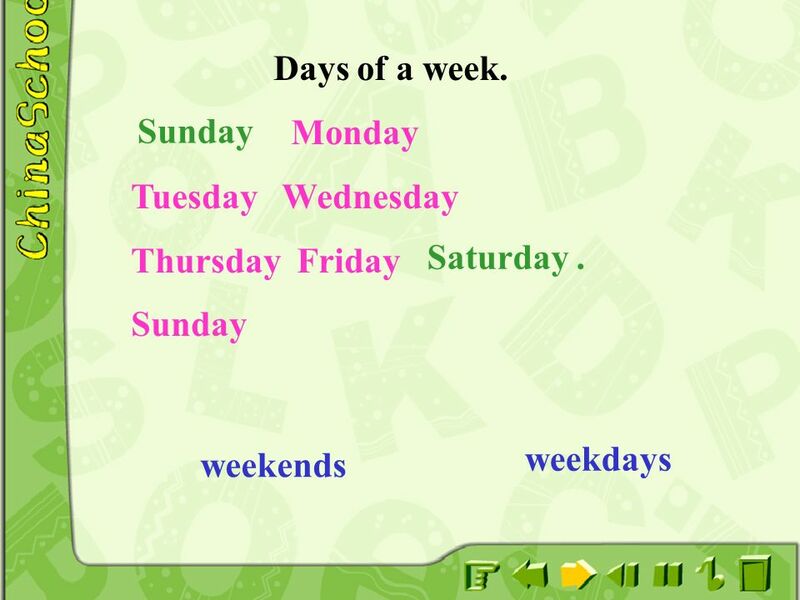 Why do you like weekend? What do you usually do on weekend? 5 How to say “周末你干了什么” in English? What did you do over the weekend? 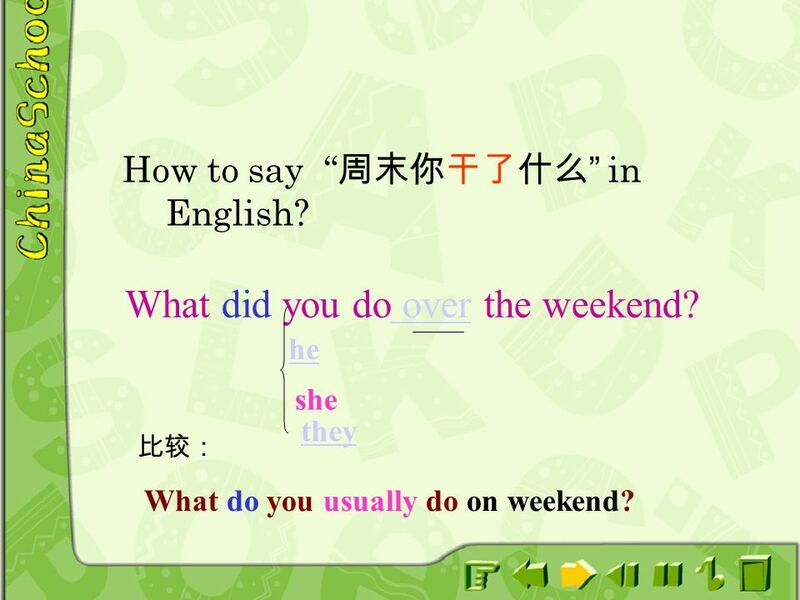 he she they 比较： What do you usually do on weekend? 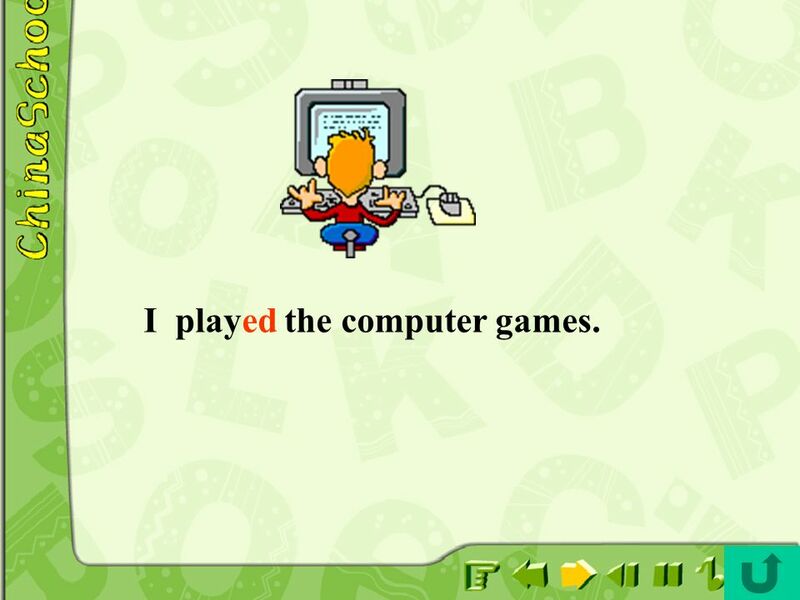 6 I played the computer games. 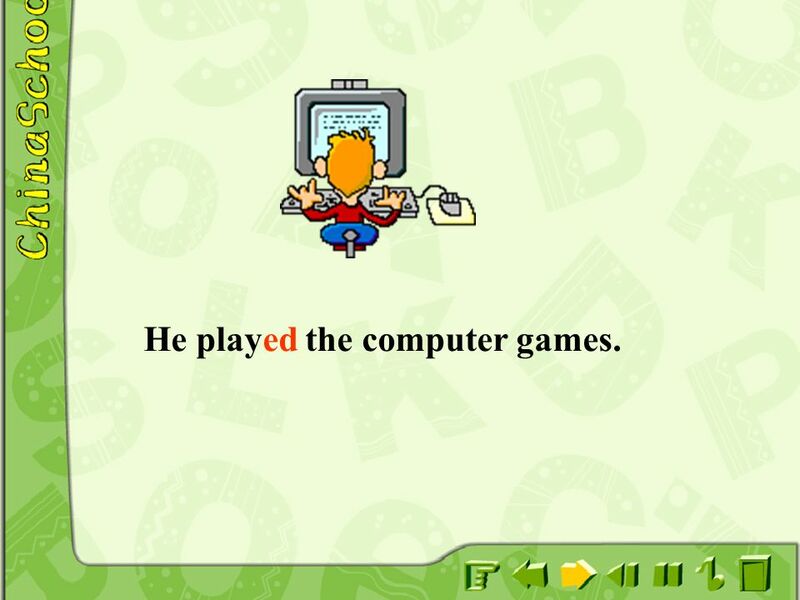 7 He played the computer games. 8 He cleaned his house. 9 He did his homework. 10 He did some reading. 14 practice 1. 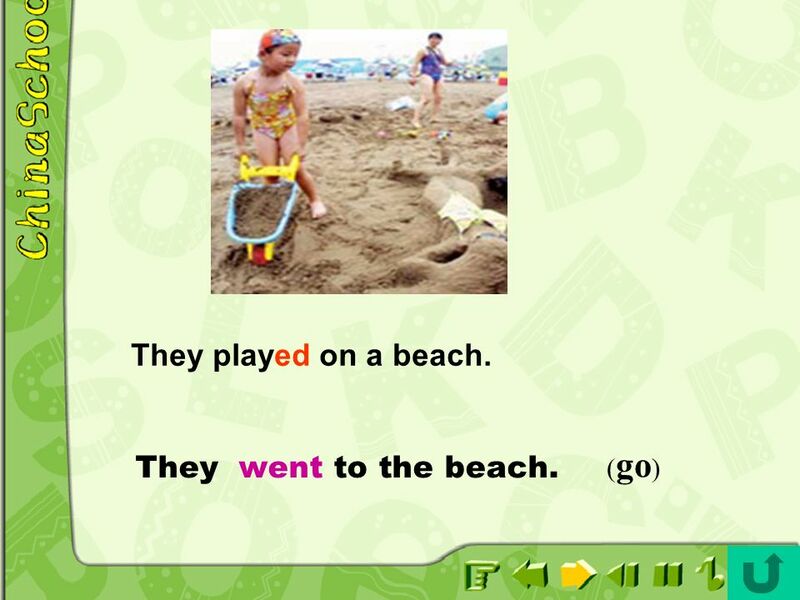 Match the words with the pictures in 1a. 2. 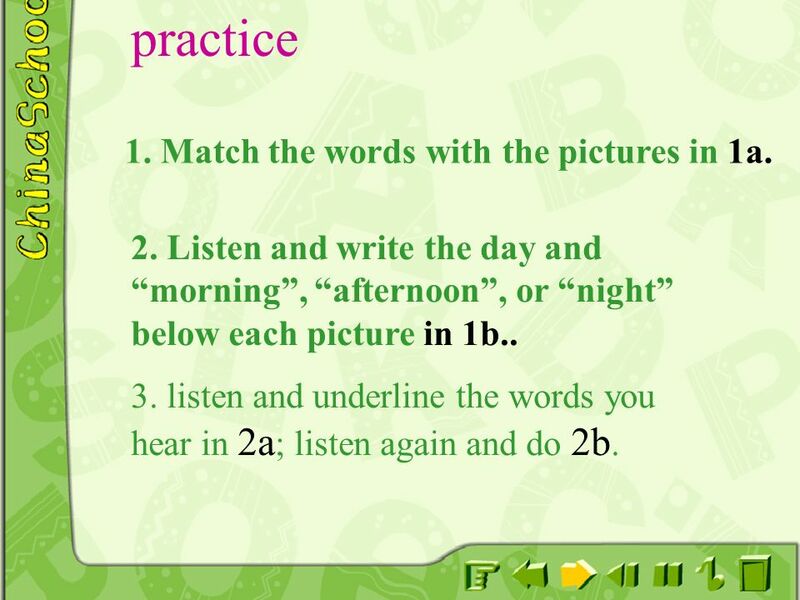 Listen and write the day and “morning”, “afternoon”, or “night” below each picture in 1b.. 3. listen and underline the words you hear in 2a; listen again and do 2b. 16 What did he /she/they do over the weekend? 17 What did he /she/they do over the weekend? 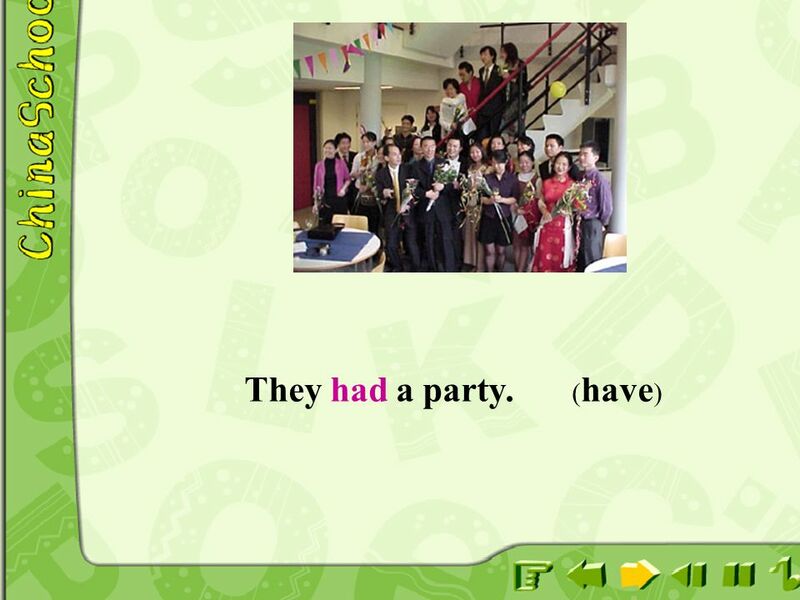 18 Fill in the blanks with suitable words. 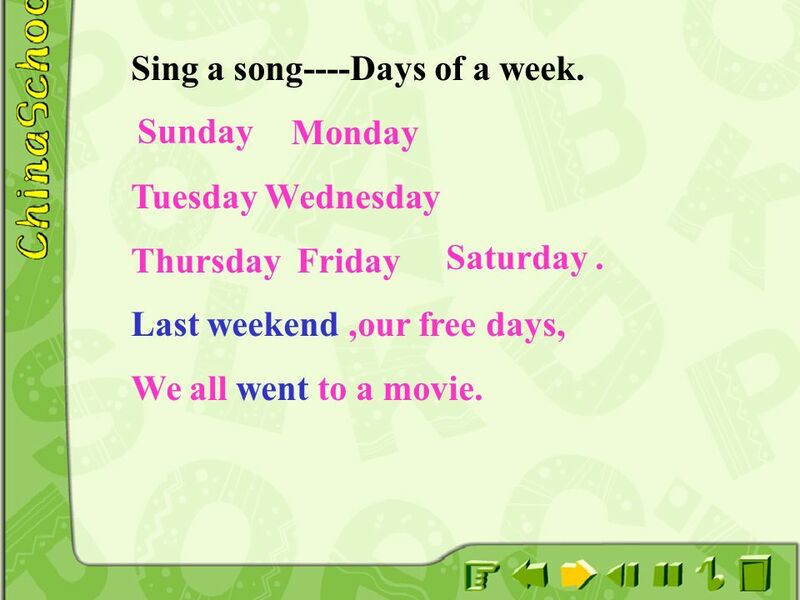 19 Sing a song----Days of a week. Monday Tuesday Wednesday Thursday Friday Last weekend ,our free days, We all went to a movie. Sunday Saturday . 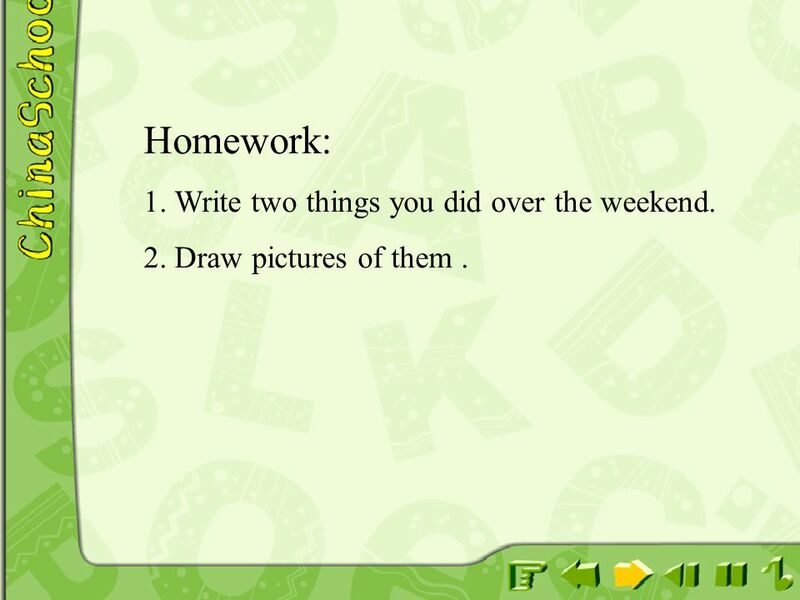 20 Homework: 1. Write two things you did over the weekend. 2. Draw pictures of them . 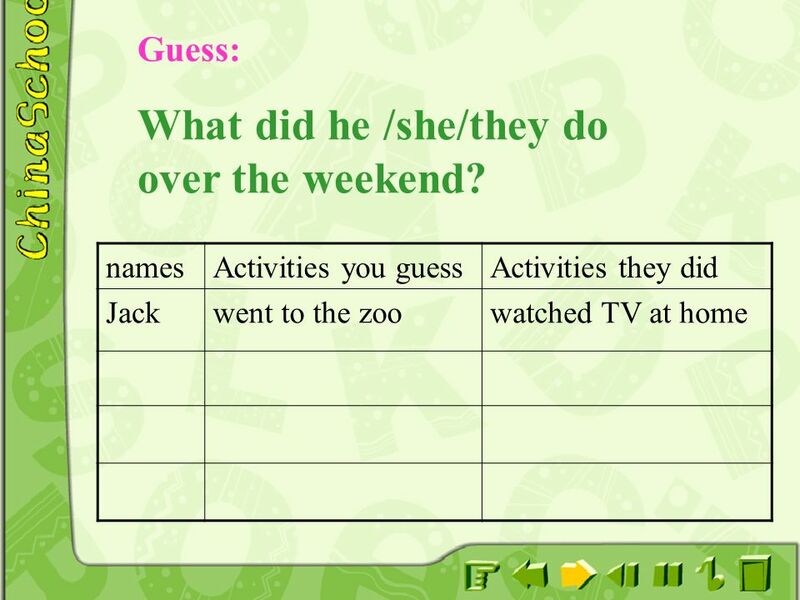 Download ppt "Unit 5 What did you do over the weekend? 南城二中 周向阳"
Chen Lingling 1.When does Jim have classes? 2.What does he do after class on Monday and Wednesday? 3. What are Lucy and Lily doing? He has classes. Unit 5 Can you come to my party. What are they doing?  I had a lot of fun with my family on Friday.  My sister and I went for a walk last night.  We started classes at the end of August.  My uncle visited. 敢于承认错误 sing 过去式 sang fly 过去式 flew. 热身练习 上个周末 下个周末 本周末 在周末 last weekend next weekend this weekend at the weekend on weekends. Section A Unit 5 Can you come to my party? What are you doing for vacation / this weekend? I'm playing soccer. I'm going to the movies. I'm visiting. Section B Period 2 (3a - Self Check) What are you doing this week? What do you have to do this week? Are you going to spend your weekend with your friends? Unit 5 Can you come to my party ? Section B 通海口一中 谢红. Go for it! 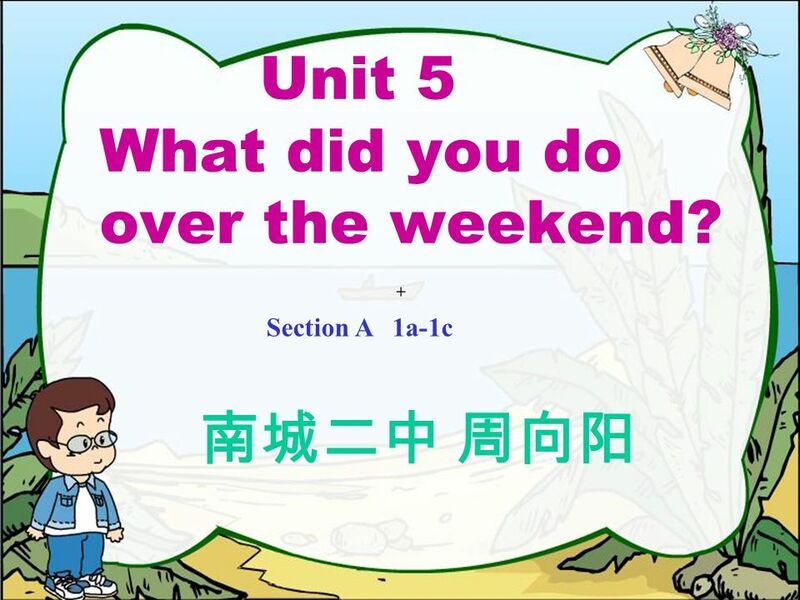 (Book 2) Unit 9 How was your weekend? By Shi Yuhua. The Olympic Games. SPORTS Skiing Skiing Swimming Swimming Volleyball Volleyball Ice-hockey Ice-hockey Skating Skating Shooting Shooting Biathlon Biathlon. Unit 10 Where did you go on vacation?. Unit 9 How was your weekend? Period 1.